From time to time over the years I have mentioned my seasonal teaching job, which requires me to travel a few times a year. This is one of those times, and how. I left home this past Friday and will be gone for two weeks. It’s the longest trip I’ve had in as long as I’ve been doing this. Right now, I’m on Long Island. Later this week I will drive up into Massachusetts before swinging back south (to New Jersey) on the coming weekend, then back north into New Hampshire next week to conclude the trip. Yeah, whoever mapped it out wasn’t having their best day. I am hoping that New England’s fall colors, which should be coming out this week and next, will compensate for the inconvenience of my schedule. What follows on the flip are some observations from the trip so far. I am staying in a town called Copiague, which I didn’t learn to pronounce until I’d been here a couple of days. Some of the other town names out here are familiar to me, even though I’ve ever been here before. Syosset, for example, was a name I came across in Mad magazine over 40 years ago and have never forgotten; Islip was where Wide World of Sports filmed figure-8 car racing, an oddball sport that the show frequently featured during the 1970s. Hicksville is not far from where I’m staying. It’s the hometown of Long Island’s most famous native, Billy Joel. I suppose its arguable that Joel is the most famous; Jerry Seinfeld grew up here, in Massapequa, also home to the acting Baldwin family. The poet Walt Whitman was born here, too. The radio stations out here play a lot of Billy Joel. One of Long Island’s most famous residents was Theodore Roosevelt, whose home, Sagamore Hill, is on Oyster Bay. It’s been restored to the way it appeared in 1905 when it served as the Summer White House. Every time I visit a National Park Service site, two thoughts recur: first, the federal government should cut a lot of other agency budgets to the bone before it dares to mess with the Park Service; and two, being a park ranger looks like a great job. (The guy who sold me my ticket to the Roosevelt home had a strong Wisconsin-Minnesota accent, although maybe he was just a hockey player. In any event, I doubt he’s from around here.) 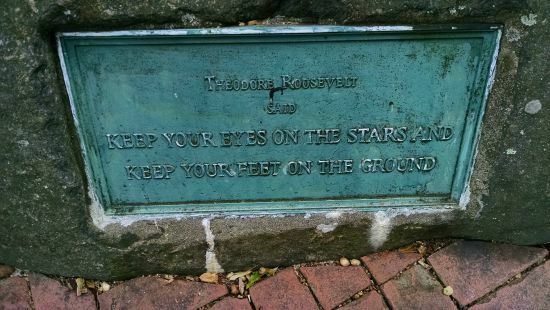 After touring Roosevelt’s house, I went to his grave in Youngs Memorial Cemetery, which has been a burying ground since the 1650s. It’s on the side of a hill and surrounded by a fence, but not much more exalted than the graves of TR’s fellow Long Islanders. Almost all of the area I’ve seen is urbanized, an odd thought considering that people move out here to get away from the congestion of New York City. Although there are more rural areas further east, the biggest open space I’ve found so far is a striking stretch of highway north of Amityville (yup, that Amityville) and east of Farmingdale that’s bordered by seven massive cemeteries. These are not the bucolic open spaces we’re used to back in the Midwest. Tombstones sit side-by-side like city rowhouses for mile after mile, which made me think of that fine old term for a grave, the “narrow house.” And that made me wonder where the term came from. Turns out it’s from “Thanatopsis,” a poem by William Cullen Bryant published in 1817 that students once read in English class, but no longer. “Thanatopsis” is not the sort of thing I expected to be reading one evening in my hotel room, but you have new experiences when you travel. You learn stuff. You never know what it’s going to be. You have to remain open to whatever the road puts in front of you. We still read “Thanatopsis” in 11th grade English (“American Lit”) around 1990. Who knows what touchscreens they now have in its place. That’s a nice find on the epitaph.